When we want to share more with other people, it is essential to be able to tell them a little about us. The first approach of courtesy or recognition is which will later allow us to engage in conversations that give us the opportunity to introduce ourselves and to open to the other person. Knowing how to say our name, our age or talk about what we do, will be fundamental. The main thing is to know the three basic verbs that will allow us to correctly communicate the information about us, which will also be important verbs throughout your learning. Learn them by heart and everything else will be much easier. Without a doubt, it is one of the most important verbs; actually, we could almost say that it is the main one. It means “to be” and is an irregular verb that is part of the third conjugation. It is one of those that you must learn by heart and you will also it use continuously. This verb is used to describe something about yourself (name/ nationality/profession) or to specify the place where you are. In addition, it has a fundamental importance because later in your learning process it will serve as an auxiliary for the verbs of movement in passé composé. 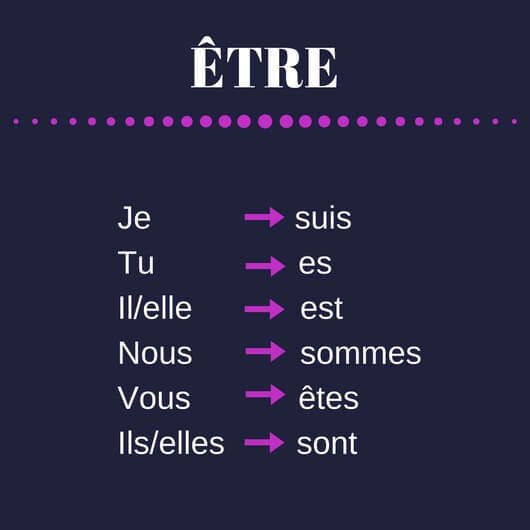 Together with être, they form the two basic and most important verbs for the correct use of the French language. It means “to have” and is a verb that belongs to the third conjugation, like the previous one. We use it to communicate possession of something, in the form of “having”, and for example to express our age (I am 20 years old = j’ai 20 ans). Using it as “having”, is only possible on the third form of the singular and under the formula: ” Il y a ” (there is). Later, it will also function as an auxiliary in the passé composé. 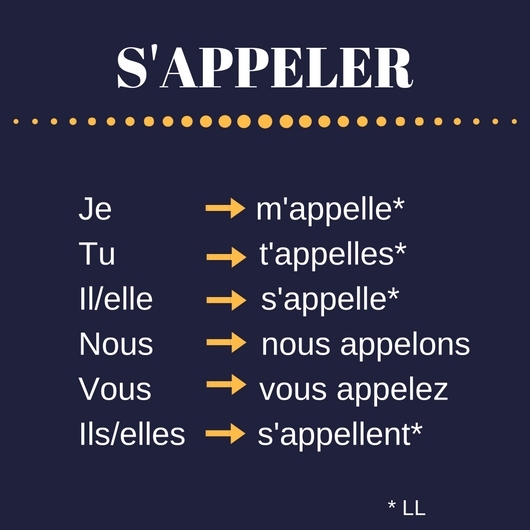 The verb s’appeler is a pronominal verb belonging to the first group (those that end in ER) and they are conjugated in the same way except for some exceptions. 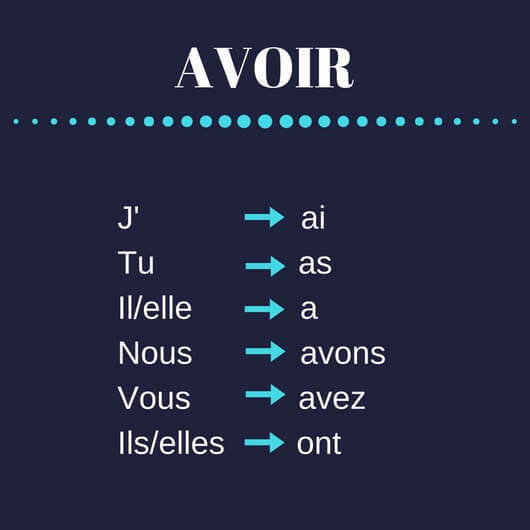 In the conjugation of this verb, there is an irregularity in the first and second pronouns of the plural (nous and vous) since an L is removed from the verb. This verb is reflective, which are those verbs that refer to an action of a subject in itself. How to ask and answer? When we meet someone, we give some basic information that will help us to introduce ourselves in a better way, as well as the same questions will arise about the person we meet. Therefore, this small box gives you the main keys to ask and answer questions when you just met someone new. Remember that, as we told you in the previous post, you should not forget to use the correct language when communicating, depending on the context, the best thing is that you address yourself formally or informally. 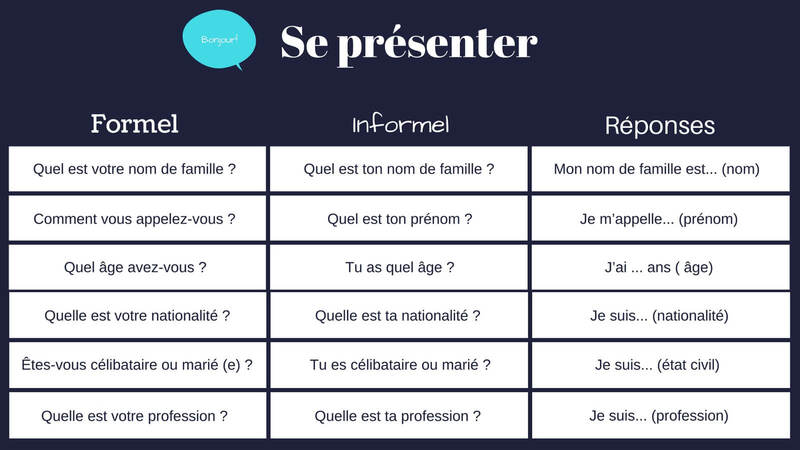 A basic presentation will consist in saying your name, your age, your nationality, your profession and your marital status. If you want to hear some examples, you just have to click here.